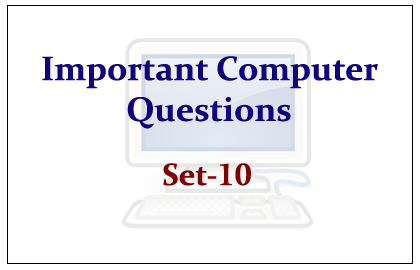 The List of Important Expected Computer Questions for Upcoming IBPS PO/Clerk/RRB Exams was given below. Candidates those who are preparing for the examinations can use these questions. 1).Among the following which is the faster communication channel? a) Pressing and holding the main mouse button. b) A symbol that designates the position on the screen where text or codes will be inserted or deleted. 3).What is mean by Cut______. a) To take a selection from the document and move it to the Clipboard. b) To cut a document in two equal parts. d) Only b and c above are correct. b) To make formatted web documents with links, those can be viewed in Web Browser. c) Used for all the formatted documents. a) It is small graphical image which is used to represent an application, command, or a tool. 8).A software to convert a complete HLL Program to machine language in one go _____. 9).Gopher displays a set of resources on the Internet in the form of _______. 10).When a language has the capability to produce new data types, it is said to be ___________.